The most exciting waterfront development in Europe - Cardiff Bay has been transformed into UK's fastest growing visitor destination with its wealth of leisure activities available both on and off the water. Cardiff was granted city status by Edward VII in 1905 and is currently flourishing with the development of the Cardiff Bay. 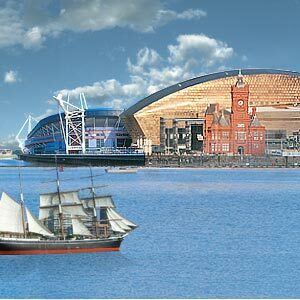 The Bay has spectacular buildings, which include Millennium Stadium and the Millennium Centre. Millennium Stadium is the international sports village and the Centre is the cultural hub of the city with exciting plays and operas. You can avail Bay Cardiff tourist information at 'The Tube'. The Tube is well recognized in the bay for its award-winning tubular design. The Tube at the waterfront has a scale model of the bay and helps the visitor with information to navigate the area's many attractions. The Tube conducts group visits for schools, colleges and other organizations. It also organizes its own resident Tour Guide around the Cardiff Bay area. Cardiff Bay has one of the oldest lightships, Lightship 2000 that has been resurrected recently as a floating Christina Centre and caf?. The Cardiff Bay Barrage, which stretches for a kilometer across the mouth of the bay, has also been revived recently. Now impounding a 500-acre freshwater lake fed by the rivers Taff and Ely, the barrage has been the catalyst for providing eight miles of waterfront. The local activities include Bay Island Voyages, a unique combination of high-speed adventure and close encounters with the local wildlife. The bay also has waterbus services that enable visitors to enjoy the waterfront developments from the comfort of fully enclosed 50 seat boats. The Cardiff Bay also has exclusive Victorian structures such as the Pierhead, where you can find futuristic and lively exhibitions. There is also a Norwegian Church that belongs to the 18th century. Alongside you can see the Techniquest, the fantastic exhibits for the visitors to explore the world of Science and Technology.